eKYC for Mutual Fund Investments - Get your KYC done online! If you are a first time investor or an existing investor in Mutual Funds, completing KYC (Know Your Customer) formalities is mandatory. This includes submission of KYC form, ID proof, PAN copy, address proof and IPV (In-Person Verification). Know Your Customer (KYC) is a onetime exercise made mandatory to invest in Mutual Funds. Sometimes getting KYC compliant can be a time-consuming task. Completing KYC formalities is considered as one of the major hurdles in attracting new investors into mutual fund investments. To overcome this, Quantum Mutual Fund has launched eKYC facility. Quantum will allow first time investors to fill up a simple form online and complete their KYC formalities in a paperless manner. There is no need to submit any forms/document proofs. IPV (Physical appearance) too is not required. So, no need to visit AMC office or CAMS or KRA offices (KYC Registration Agency). Reliance Mutual fund house has also started accepting eKYC online applications. I strongly believe that all major Mutual Fund houses will soon enable this facility on their respective websites. 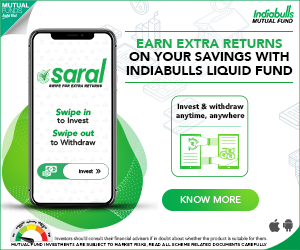 What is Mutual Fund eKYC? eKYC or Electronic KYC is a KYC compliance procedure that allows you to complete your KYC formalities completely online, without any paperwork whatsoever. E-KYC is a simplified KYC for mutual fund investments based on PAN and Bank A/c no. details. eIPV (electronic In-Person Verification) is mandatory. 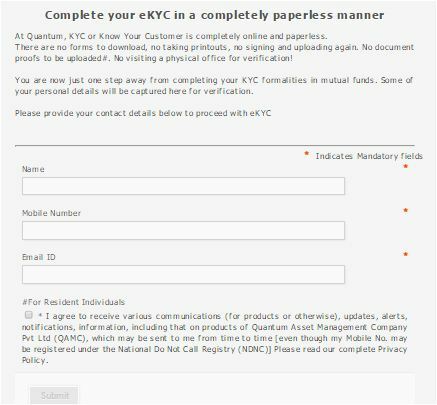 What is the eKYC process at Quantum Mutual Fund? Provide name, mobile number and email id details. Provide your Personal and Bank Account details. Upload your supporting documents. Document upload in case of Resident individual is optional and for NRI’s this step is mandatory. Post entering the details and uploading of document, as stated above, you have to agree & accept the declaration and submit the details online. After submitting the KYC form online, the next step is e-IPV. The customer care team of Quantum will schedule e-IPV (Electronic In-Person Verification). EIPV is a face to face online meeting with the investor (applicant) through Webex or Skype via desktop/laptop/smartphone. You need to show your original PAN card and Bank statement (or passbook) during the online meeting (EIPV). Also, you will be asked to sign on plain paper in non-black ink color, this signature of yours should match the signature in the PAN card. 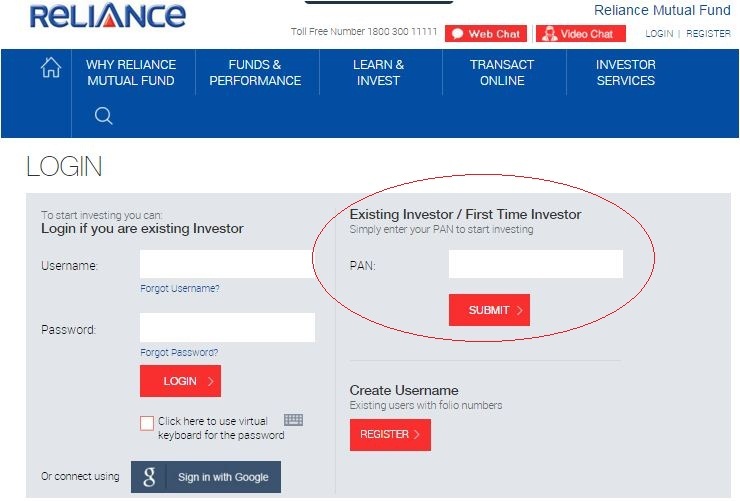 What is the eKYC process at Reliance Mutual Fund? Visit Reliance Mutual Fund website for eKYC. Click here.. 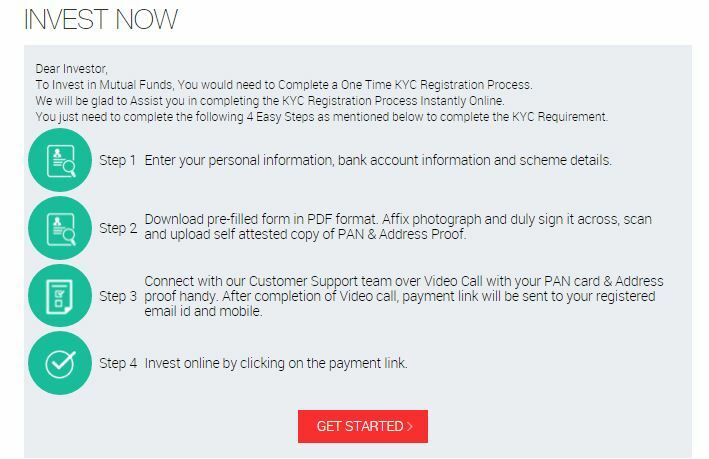 Enter your KYC non-compliant PAN. In the next window you can find eKYC process details. Enter your personal and bank account details. Download Pre-filled KYC form, sign and upload it along with the self-attested copies of PAN & address proof. Schedule a Video call with the customer care and complete IPV (In-Person Verification process). You have to send the physical copy of your pre-filled and signed KYC application form to Reliance AMC. (No need to send physical copies of supporting documents). Once EIPV is done, your KYC details will be shared with KRA. Once your KYC is registered and validated, you will receive the confirmation via email / letter. You can also visit the websites of any KRA and verify your KYC status online. KYC is a one-time process. So I believe that once your PAN is KYC compliant (through the above eKYC process), you can make mutual fund purchases or redemptions of any mutual fund house schemes. Mutual Fund Houses are also in talks with SEBI (Securities Exchange Board of India) to allow investors to invest in MFs by simply using the Aadhaar number. Let’s hope that a truly paperless eKYC for mutual fund investments will beocme a reality in the near future. Thanks a lot Amit. Really informative article. awaiting. It is demand of the portal to upload at least two documents. I do not under stand what to do about it. Please suggest. Moreover, the portal for e-Kyc asks for certified copy to be uploaded. First to scan copy of document, then to certify and upload thereafter. This is the only way to submit certified copy of document to submit. Dear Sanjoy ..You have to sign and upload Pre-filled application form along with the self-attested copies of PAN & address proof. 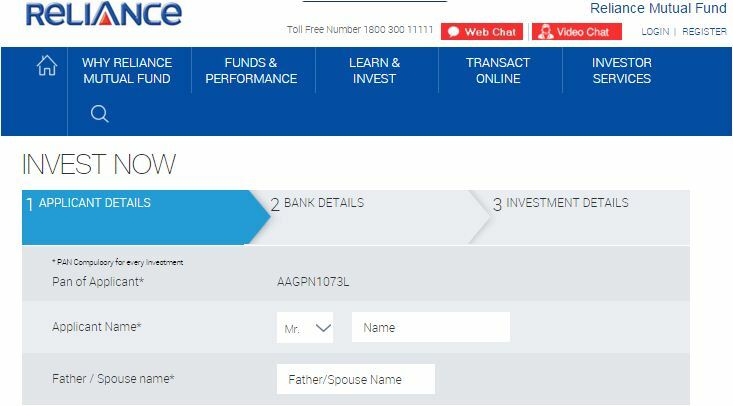 Is it compulsory to buy MF from quantum or reliance amf if we do e-kyc from them? Dear PJ..I don’t think it is compulsory. First of all thank you for sharing such important information with us. I want to ask you that I lost my PAN Card & have only photo copies of my pan card with me. So, may I eligible for applying eKYC ? Though I have my Aadhaar card, passport & driving license with me. Suggest you to apply for duplicate PAN card immediately. You can apply for ‘Reprint of PAN card’. Finally got my KYC done through dotx kra, but made a mistake applied for pan card before reading your comment through utiitsl and now they put my application on hold due to mismatch in my name. What do you suggest shall I wait or re apply through NSDL? Dear Dhruv..I did not understand your query..
My name is not accepting in this form even though I write my name as it is in Pan Card. Always coming like Please enter your full name as given in PAN . So please help me to register with KYC. Kindly note that that First name, middle name & last name of your PAN can be stored in the IT departments (PAN) in a different way. You have to keyin the details exactly. Thanks for your reply. Regarding Bank details for KYC, which account I have to give, NRI account or saving account?. 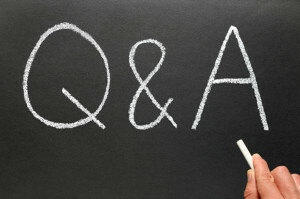 Is there any drawbacks to give NRI account. Dear Amit..Yes, once your PAN is MF KYC compliant then you can invest in any of the MF schemes. i have got enough help from you, your articles are very very simple and informative. Kindly share the articles with your friends.